The huge ski area above the world famous ski holiday resort of Ischgl has long drawn masses of people from season opening through to season closing. With endless ski pistes and high capacity lifts in the ski area it is hard to appreciate the popularity of the place as the skiers and boarders disperse far into the distance. However try getting an early lift up the mountain in the winter season and the queues demonstrate the downside of being such a great ski area. There are 3 separate lifts leaving the resort and the queues can be whopping at times. So Ischgl decided to invest in a replacement to the existing Pardatschgratbahn gondola that will run parallel to the existing 4 seater gondola. 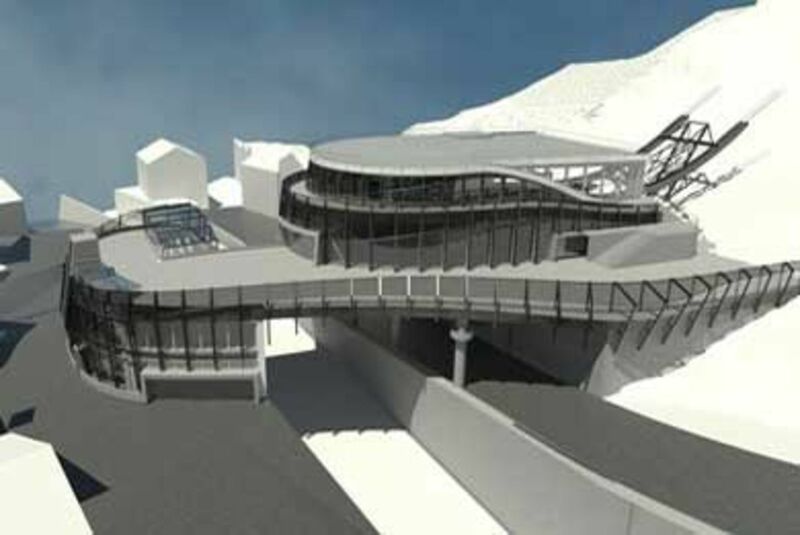 The lower section of the 4 seater gondola will be demolished whilst the section from the mid-station upwards will remain to serve as additional uphill capacity. The new Pardatschgratbahn will consist of 28 capacity tricable detachable cable car and will offer greater comfort, weather resilience and capacity. The base-station developments are clearly taking shape in the resort and when completed the base-station will be something of an architectural marvel and focal point for the area. The development is scheduled for completion in time for the new 2014/15 winter season and whilst Ischgl is only likely to go from strength to strength, the increasing number of visitors will hopefully see fewer queues as a result of the new Pardatschgratbahn.